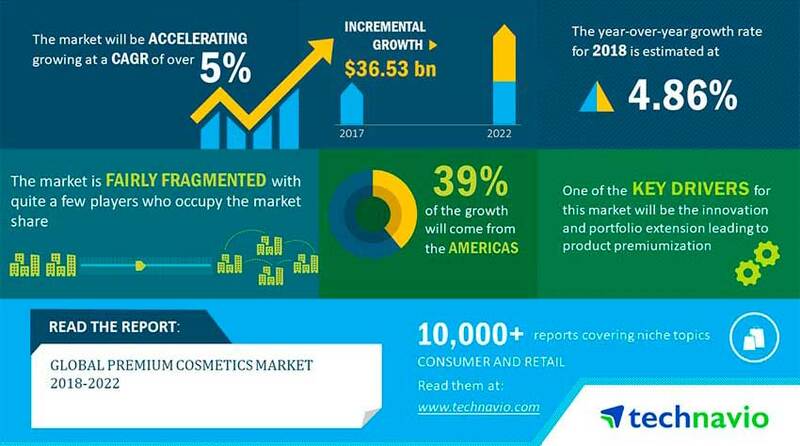 In its latest market research report, Technavio projects the global premium cosmetics market to grow at a CAGR of more than 5% over the next five years. The report segments the market by product—skin care, fragrance, color cosmetics, hair care, sun care, deodorants, baby care and bath products—and key regions: the Americas, APAC and EMEA. It also covers the drivers, challenges and landscape of the market. Skin care products held the largest market share in 2017 at 37%, and is predicted to dominate the market throughout the forecast period. Among regions, the Americas accounted for more than 36% of the market share and is expected to grow steadily during 2018–2022. Major trends in the market include multichannel marketing; social media as an tool to increase product awareness and engage with consumers; and social networking as a tool for consumers to educate themselves about premium products. Additionally, consumers seek products that address multiple concerns.